It is inevitable in any sport such as Weightlifting that separates competitors into bodyweight categories that the participant will be faced with the proposition of manipulating their normal bodyweight up or down for a competitive advantage. More often, the proposition involves the athlete in weight loss and ‘making weight’ to compete in a lighter category than their normal bodyweight would allow. The weight loss will in some measure require the athlete to alter their normal diet over a period of days/weeks and/or implement various dehydration strategies during the last 24 hours before the weigh-in. Ideally, the athlete is able to reduce to the required bodyweight by obtaining, and observing in a disciplined manner, qualified nutritional advice so as to minimise detriment to performance. However, apart from the difficulty in obtaining qualified advice, efforts to reduce bodyweight do not easily achieve success for a variety of reasons. These reasons include a lack of support or understanding in the athlete’s home or work environment, insufficient athlete knowledge or motivation, dealing with emotional consequences of everyday life, the need for socialisation and difficulty measuring bodyweight accurately and timely. Moreover, attempts by an athlete to change their body mass meet with the body’s own regulatory mechanisms that alter metabolism to resist bodyweight loss (O’Connor and Caterson, 2010). Dietary approaches for weight loss must take a number of factors into consideration. These factors include effect on performance, risks to health and normal body functioning, effect on muscle mass, adequacy of micronutrients, and diet simplicity to ensure compliance. In general, dietary approaches to weight loss rely firstly on the maintenance of a diet that is hypocaloric (deficient in energy), secondly a manipulation of the ratio of macro nutrients (carbohydrate, fat and protein) and thirdly an alteration of food sources within the macro nutrient groups. Eat plenty of fresh vegetables and legumes. Opt for low-fat snacks such as fresh fruit instead of cakes, biscuits and pastries which are generally high in fat. The energy density of the daily diet can also be reduced by replacing carbohydrate (CHO) foods with high glycaemic index (GI) with CHO that is lower in GI. The manipulation of the diet in manner is not associated with negative health consequences (O’Connor and Caterson, 2010). However, although a reduction of high GI foods may worth considering, there is ample evidence that in a hypocaloric diet, the proportion of CHO intake must be maintained at the expense of fat. Therefore, as a consequence, it is necessary to be cautious in reducing high GI CHO unless the individual is prepared to eat larger quantities of lower GI CHO. In effect, it is unwise to maintain a hypocaloric diet by reducing the total energy value provided by CHO. A significant issue in maintaining a hypocaloric diet is that it may have negative consequences on performance as a result of significant losses in lean mass, strength and an increased susceptibility to illness (Kreider et al., 2010). However, studies have provided evidence that muscle mass loss can be reduced by (i) increasing the ratio of protein to CHO intake and/or (ii) amino acid supplementation. A study by Layman et al (2005) was able to show that a change in the normal CHO:Protein ratio from 3.5:1.0 to 1.5:1.0 reduced lean muscle mass loss. Another study by Dudgeon, Kelley and Scheett (2016) showed that subjects who took a Branched Chain Amino Acid (BCAA) supplement while performing resistance training on a hypocaloric diet maintained muscle mass while subjects who did not take BCAA lost muscle mass. Furthermore, a study by Mettler, Mitchell and Tipton (2010) examined the affects of a 14 day hypocaloric diet on athletes. In this investigation, CHO was maintained at 50% of total energy intake for both the experimental and the control groups. However, in the experimental group, dietary protein intake was 36% as compared to 14% in the control group at the expense of fat. The effect of this manipulation was that on average, the decrease in lean body mass of the high-protein group was less than 20% of the control group. There is also evidence that a diet high in dairy products has a useful effect on weight loss as a result of the calcium component stimulating the breakdown of lipids and inhibiting the conversion of carbohydrates into lipids for storage (Zemel et al, 2004). The negative aspects of weight loss as a result of dietary restriction cover a wide range including performance decrement, loss of muscle mass, amenorrhea, impairment of immune systems, changes in mood states and the likelihood of rebound effect when dietary restriction is ceased. In regard to performance decrement, there is a lack of published work that specifically analyses the effect of gradual or rapid weight loss on performance of Weightlifters. However, in studies in relation to anaerobic performance more generally, negative effects have been found (McMurray, 1991; Maffulli, 1992). In the McMurray study, subjects on a 7-day calorie restricted diet were divided into two groups – high CHO and normal CHO. The high CHO group were able to maintain performance on a Wingate Anaerobic Test whereas the normal CHO group showed a significant reduction in total and mean power output. In the Maffulli study, which was on wrestlers, anaerobic capacity measured by uphill running and strength endurance decreased although maximum isometric strength was maintained. In conclusion, Maffulli stated that the rate of weight loss is probably important and that if the rate is too high lean tissue is unnecessarily lost with deleterious effects on performance. In regard to rapid weight loss, as in making weight, the extent of negative effect may depend on the duration and extent of hydration and ingestion of carbohydrate (McMurray, 1991). Nevertheless, there are reasonable grounds to suggest that even after 1-3 hours of hyperhydration, muscle function is not completely restored (Torranin, 1979). When time permits, weight loss should be slow and involve a moderate reduction in the daily energy intake of the order of 10-20%. A reasonable ceiling for energy deficit is 500Kcal/day. This will produce around 0.5Kg per week of bodyweight loss. This level of energy deficit is afforded by preferencing low fat foods, and avoiding food with high-glycaemic index i.e. sugar content. If an athlete is desiring to lose 5Kg, in say 3 months, then average weight loss per week needs to be 384g/week. Under these circumstances, the athlete should aim nearer a 10% reduction in energy intake rather than 20%. Generally, weight loss results in a decrease in muscle mass as well as fat mass. To minimise, muscle mass loss, the diet should be manipulated by increasing the proportion of protein. This will entail a small reduction of dietary fat and carbohydrate. However, the athlete should know and understand that very low levels of dietary fat and carbohydrate may affect health and well-being. Protein rich foods that will assist the athlete to increase protein while diminishing fat intake include lean meat, fish, low fat dairy products, legumes, wholegrain, oats (Tipton, 2009). Some consideration should also be given to ingestion of BCAA (Leucine) as it stimulates protein synthesis signalling pathways in muscle cells (Tipton, 2009). In circumstances where the weight loss task is more substantial and difficult, for example if desired weight loss needs to be greater than 0.5Kg per week, then the athlete is well advised to seek the counsel of a nutritionist for a dietary plan. Under no circumstances should athletes take diuretics to make bodyweight. Apart from the health risks, diuretics are a banned substance by WADA. A 19-yr old male weightlifter has a national competition coming up in 7 days, at which he hopes to compete in the 69Kg category and qualify for the Commonwealth Games team. He is currently 2.0Kg over the weight limit for his category. Let’s also assume that the official weigh-in will take place at 10:00am on the day of the competition start. Time available is critical! 24 hours restriction of fluids intake to reduce bodyweight by the remainder of 1.6Kg required. The first assumption is that the athlete, or the coach, or the person giving nutrition advice has a reasonable understanding of the average daily energy intake of the athlete. The second assumption is that the athlete’s bodyweight is consistently 2.0Kg over weight class limit and not some temporary aberration. In such a circumstance, this could cause wrong advice to be given. The third assumption is that the athlete has been checking the bodyweight first thing in the morning. The fourth assumption is that the athlete has access to accurate scales at all times and this can be a major problem. There is a risk that the athlete, faced with a need to lose 2.0Kg, will overshoot and this risk will be magnified if extensive travelling is involved. Experience, is the greatest asset in weight reduction. It is very important to gain information about the athlete’s present diet and to look for opportunities to make minor adjustments in energy intake that might amount to 500Kcal/day. These opportunities might include avoidance of foods with high-glycaemic index, e.g. sugar, cakes, confectionery, biscuits, soft drinks. Other opportunities to lower energy intake might include a switch to low fat foods, or a general reduction in foods containing fat. However, it is necessary to be cautious in giving nutritional advice that will not result in the athlete going into an energy deficit of more than 500Kcals/day. It is likely that the athlete will experience a higher resting metabolic rate (RMR) due to pre-competition stress/anxiety. As a result the athlete’s bodyweight may fall even without a change from normal diet. Further questions should be asked about the athlete’s protein intake. While there is some diminution of total energy intake, the athlete should be counselled to continue to eat high quality lean protein to mitigate loss of muscle mass. The athlete should check (on accurate scales) and record their bodyweight first thing in the morning each day after voiding urine, and relay this information back to their advisors. The objective of the 6 day energy restriction is to reduce bodyweight by 400g and reach 70.6Kg at the start of the day prior to competition day. The athlete should begin the prior day by checking bodyweight on accurate scales immediately after rising and voiding urine. The task of how much bodyweight needs to be removed now needs to be exactly known. Rankin (2010) provides a caution that athletes should not attempt to lose more than 2% of bodyweight by dehydration. The remaining 1.6Kg bodyweight loss for a Weightlifter weighing 70.6Kg by using dehydration is just slightly more than this safety guideline at 2.3%. At this stage, it would be reasonable to proceed with dehydration as the strategy to remove the remaining bodyweight. Furthermore the following protocol is based on the athlete not attempting to reduce fully down the night before but utilising the hours of sleep for weight loss. US Rowing (2016) has provided a view that coming down the morning of weigh-in is more effective than coming down the night before and attempting to stay down. Note: Athletes may see fit to not check their bodyweight every 2 hours or may be involved in activities that do not permit. Nonetheless, it is useful to estimate where the athlete should be in bodyweight at various time of the day. Following weigh-in, the athlete should set about restoring hydration level and energy balance and optimise muscle glycogen as soon after the weigh-in as possible. In regard to restoring hydration level, the optimal strategy would involve the consumption of 150% of the fluid volume lost (Shirreffs and Maughan, 2000). The 50% extra amount of fluid needed compensates for the amount that will be voided in urine. There should not be a reliance on thirst sensation but forced drinking may well be necessary to compensate for water deficiency (Pettersson and Berg, 2014). This level of water consumption is often referred to as aggressive rehydration (Shirreffs and Maughan, 2000; Slater et al., 2005). However, rather than ingest merely plain water, the athlete would be well advised to consume fluid containing electrolytes or take a sodium tablet (Nose et al, 1988). Plain water ingestion dilutes dilutes blood plasma osmolality and this may exacerbate the issue and result in increased urine production and decreased thirst (Nose, Mack, Shi, Nadel, 1988). There are numerous sports drinks on the market that provide electrolytes in an appropriate concentration that will minimise adverse changes to plasma osmolality. In addition to restoring hydration level, the athlete should be consuming high carbohydrate food sources (Rankin, 2010). There is little time for digestion and this is exacerbated by anxiety and therefore foods need to be quick and easy such as liquid meal replacements, fruit, yoghurt, flavoured milks and cereal bars (Sport Dieticians Australia). The Australian Institute of Sport provides a fact sheet title Liquid Meal Supplements which is well worth reading (see References for URL). Better Health (Victoria State Government). 10 tips to cut down on fat. Cardiff University School Of Medicine, date unknown, Neutrophil Function, accessed from http://medicine.cf.ac.uk/molecular-experimental-medicine/imem-research/ionic-cell-signalling/neutrophil-signalling/neutrophil-resources/neutrophil-function/ on 10/09/13. Costill D. and K. Sparks, 1973, in Rankin, J.,2010, Making weight in sports. In Clinical Sports Nutrition 4th Ed. Edited by L. Burke and V. Deakin. McGraw-Hill, Sydney. pp 149 – 170. Cox, P. (1987). Insensible water loss and its assessment in adult patients: a review. Acta anaesthesiologica scandinavica, 31(8), 771-776. Layman, D. K., Evans, E., Baum, J. I., Seyler, J., Erickson, D. J., & Boileau, R. A. (2005). Dietary protein and exercise have additive effects on body composition during weight loss in adult women. The Journal of Nutrition, 135(8), 1903-1910. Pettersson, S., & Berg, C. M. (2014). Hydration status in elite wrestlers, judokas, boxers, and taekwondo athletes on competition day. International journal of sport nutrition and exercise metabolism, 24(3), 267-275. Rankin, J., 2010, Making weight in sports, in Clinical Sports Nutrition 4th Ed. Edited by L. Burke and V. Deakin. McGraw-Hill, Sydney. pp 149 – 170. Reithner, L. (1980). Insensible water loss from the respiratory tract in patients with fever. Acta chirurgica Scandinavica, 147(3), 163-167. Sawka, M. N., Cheuvront, S. N., & Carter, R. (2005). Human water needs. Nutrition reviews, 63(suppl 1), S30-S39. Shirreffs S. and Maughan R., 2000, in Rankin, J., 2010, Making weight in sports, in Clinical Sports Nutrition 4th Ed. Edited by L. Burke and V. Deakin. McGraw-Hill, Sydney. pp 149 – 170. Slater, G. J., Rice, A. J., Sharpe, K., Tanner, R., Jenkins, D., Gore, C. J., & Hahn, A. G. (2005). Impact of acute weight loss and/or thermal stress on rowing ergometer performance. Medicine and science in sports and exercise, 37(8), 1387. Thomsen et al, 2008, in Tipton, K., 2009, Protein and Weight Loss, Sport Nutrition Conference, Birmingham, Nestle Nutrition Institute, video. Tipton,K., 2009, Protein and Weight Loss, Sport Nutrition Conference, Birmingham, Nestle Nutrition Institute, video. Zemel et al, 2004 in M.M. Manore and J.L. Thompson (2010). Energy requirements of the athlete: assessment and evidence of energy efficiency. In Clinical Sports Nutrition 4th Ed. Edited by L. Burke and V. Deakin. McGraw-Hill, Sydney. pp 128. 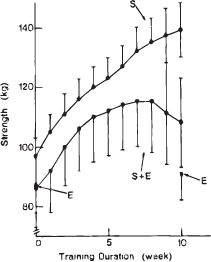 Figure 4: Hickson (1980): Graph that compares strength gains of athletes training in strength only compared with athletes training strength and endurance concurrently. Is it possible to adapt simultaneously to strength training and endurance training? Considerable research has been undertaken in an attempt to answer this question. While there is a preponderance of evidence that suggests that training on endurance compromises strength development, particularly when the same body part is involved, some studies have not found an ‘interference effect’ on strength development as a result of endurance training. The variation between the many studies however may be a result of differences in study design, duration of study, pre-test fitness of subjects, the mode and intensity of training, and strength assessment procedures (Leveritt et al. 2003). The first study to discuss the interference effect of endurance training on strength development was by Hickson (1980). In this study subjects were assigned to one of three groups: training on strength and endurance simultaneously (SE group), training on strength only (S group) or training on endurance only (E group). The exercise regimen of the SE group combined the separate training of the S and E groups. Hickson’s finding was that the SE group increased in strength for first 6-7 weeks, levelled off in week 8 and then surprisingly lost strength in the final 2 weeks as Figure 3 shows. However the S group continued to improve in strength. Hickson’s conclusion, therefore, was that at the upper limits of strength development, aerobic training inhibits or interferes with further increases in strength. This view is supported by several studies. Hennessy and Watson (1994) found that improvements in power (vertical jump) and speed (20m sprint time) developed only in a group engaging in strength training but not in a group engaging in combined strength and endurance training (running training 4 days per week). Hennessy and Watson concluded that a combination of strength and endurance training resulted in gains in upper body strength gains but compromised power and strength development in the lower body. This finding adds weight to the view that fatigue is an underlying cause of the interference effect and that it develops as a result of reduced recovery time between strength training sessions. The diminished recovery time may also result in reduced muscle-glycogen content (Nader, 2006). At moments when the Weightlifter applies maximal force, the internal pressure in working muscles is sufficiently great to interrupt blood flow. How does this affect the cardiovascular system, particularly the heart? It is unsurprising, for those who have some experience of the sport, that an extreme elevation of blood pressure has been found to occur during high-intensity Weightlifting movements (MacDougall et al, 1985). Blood pressure (BP) was measured by MacDougall and colleagues by inserting a pressure transducer into the Brachial artery in subjects who performed a double-leg press. The recorded highest pressures were 480mmHg systolic and 350mmHg diastolic and this amounts to a four-fold increase over normal BP . This extreme elevation in BP is a another example of homeostasis at work, and is the body’s mechanism to preserve blood flow in the extraordinary circumstance of lifting very heavy weights. The occlusion of blood vessels within contracting muscles is the first factor in the elevation of BP. During a heavy lift, the tension created within working muscles puts pressure on blood vessels and blood flow ceases completely if this pressure is sufficiently great. According to MacDougall and colleagues (1985), occlusion occurs when intra-muscular pressure reaches 350mmHg and it is interesting to note that researchers have obtained values far in excess of this figure. In one study, a maximal value of 570mmHg was found for intra-muscular pressure in the vastus medialis in subjects performing isometric contraction (Sejersted et al, 1984). Similarly, in another study in which subjects performed isometric contractions, a maximal value of 1025mmHg was found for intra-muscular pressure in the quadriceps (Sylvest & Hvid, 1959). While these two studies have produced significantly different maximal values, the complete occlusion of blood vessels in the legs during heavy lifts appear to be a strong possibility. The second factor in the elevation of BP is the build up of pressure in the chest and abdomen through the use of the Valsalva Manoevre by the athlete (Haykowski et al., 2002). In Weightlifting it is common, if not necessary, for participants to fully inflate their lungs and then hold breath completely during brief moments of high-intensity exertion. In effect what happens is that the athlete prevents any escape of air from the lungs by closing the glottis, mouth and nose, while at the same time the chest and diaphragm muscles forcefully squeeze on the column of air contained within (Wilmore, Costill & Kenney, 2008). This is known as the Valsalva Manoeuvre and as a result of this action, the athlete can develop very high pressure in the chest and abdomen (intrathoracic pressure) and in Weightlifting this is greatly important in maintaining rigidity of the upper body. If rigidity of the upper body is not maintained during heavy lifts, a significant amount of force that the athlete generates during the course of a lift will be absorbed by the body and not transmitted to the bar. A useful analogy to consider is how a tyre becomes more rigid when a greater amount of air is pumped into it. A slack tyre absorbs the impact of every bump that the wheel runs over. The third factor involved in the extreme elevation of BP during Weightlifting is an autonomic reflex that constricts blood vessels in areas of the body which are not vital to the exercise so as to route more blood to working muscles (MacDougall et al, 1985). For example, the walls of arteries and arterioles that supply blood to the intestines will constrict to decrease blood flow as a result of innervation by the sympathetic nervous system. This factor is the lesser of the three contributing factors. These factors conspire to momentarily reduce BP to 25-50mmHg (Compton, Hill, & Sinclair, 1973) causing a lack of blood returning to the heart and a reduction in cardiac output. This situation has a potential to cause insufficient blood flow to the brain and threatens the athlete’s ability to maintain consciousness. It may assist the athlete to avoid this situation by completing the jerk as soon as possible i.e. beginning the dip within 1-3 secs of rising out of the clean. Trying to regain full consciousness by hyperventilating or waiting for the head to clear does not assist and may endanger the athlete further. How does the heart adapt, if at all, to dealing with phenomenal increases in blood pressure during Weightlifting movements? Unfortunately there is no complete agreement between researchers as studies have produced different findings. Some findings suggest that a form of adaptation known as concentric hypertrophy (see illustration below) appears in Olympic Weightlifters (MacDougall et al, 1985; Haykowski et al., 2002; Mihl, Dassen and Kuipers, 2008). Other researchers, however, have refuted this and put forward the view that the effects of strength training on the heart are small or insignificant in comparison to untrained individuals (Wernstedt, et al., 2002; Lalande & Baldi, 2008). It is probable that changes to the heart in many of the subjects examined was small and close to the methodological error of echocardiography. (Haykowski, et al, 2002). In reality, all forms of high intensity training are associated with adapative changes of the heart, and in particular hypertrophy of the left ventricle (MacFarlane) from which blood is pumped around the body. What is in question is whether there are different adaptive changes in Weightlifters as compared to endurance athletes, or for that matter other strength athletes. Furthermore, if there are differences, which are beneficial? It has been stated that eccentric hypertrophy of the left ventricle is found in elite distance runners (Macfarlane et al, 1991) and bodybuilders (Haykowski et al., 2002). This suggests that the type of training performed by bodybuilders, where repetitions are commonly performed to failure, has a significant endurance training effect. In eccentric hypertrophy, the internal cavity dimension of the left ventricle is increased and this allows the heart to pump a greater volume of blood per beat (stroke volume). In concentric hypertrophy, which according to some researchers is more prevalent in Olympic Weightlifters, the left ventricle is unchanged or is smaller in internal cavity dimension. This reflects the predominance of low repetitions in the training of Weightlifters, where intensity is far more important than endurance. But then comes Crossfit, in which athletes strive for fitness in both strength and endurance. A study by Edwards (2012) provided not unexpected evidence that Crossfit athletes showed greater ventricular cavity dimensions and greater ventricular wall thickness, adaptations exhibited by endurance athletes and bodybuilders. Is there any benefit to the Weightlifter to engage in some form of endurance training to encourage eccentric hypertrophy, that is larger internal cavity and higher stroke volume? Is there a negative aspect of concentric as opposed to eccentric hypertrophy for Weightlifters? Is endurance training in some form incorporated into the training of elite Weightlifters who occupy the top 10-15 positions at World Championships? Is it a time limitation decision? For the majority of competitive Weightlifters who train 8-10 hours per week, is it a matter that endurance training is a low priority as compared with time spent on strength training? Does it become increasingly more important for the Weightlifter to incorporate some endurance work into the weekly training schedule the more they advance in qualification, or is it completely the reverse and that beginners in Weightlifting need greater amounts of endurance training? If Weightlifters had greater endurance fitness would they be able to withstand a higher volume of training? Answers to these questions probably do exist somewhere in the world, and of course many people involved in all sports that utilise some form of resistance training will likely have an opinion. In the author’s opinion, there has been no radical shift in the training of weightlifters with regard to endurance in the past 4 decades. Personal observations provide anecdotal evidence of a consistent lack of endurance training in any form among Weightlifters at all levels of ability, working with different coaches and in different regions. At times of the year, Weightlifters will commonly undertake higher repetition training in which the average number of reps per set is increased to 5 on all exercises. For the majority of Weightlifters, this form of training is the nearest resemblance of endurance training that they experience and is often maintained only for 4 weeks at a time due to the preference of athletes and coaches to return to “normal” high-intensity, low repetition training. It is possible that the influx of Crossfit athletes into Weightlifting will, in time, have an impact on standard training methodology employed in Weightlifting. But even if it just causes the Weightlifting fraternity to re-examine current practise, it will be a good thing. Compton, D., Hill, P. M., & Sinclair, J. D. (1973). WEIGHT-LIFTERS’BLACKOUT. The Lancet, 302(7840), 1234-1237. Sylvest, O. & Hvid, N. (1959). Pressure measurements in human striated muscles during contraction. Acta Rheumatologica Scandinavica, 5 (1-4), 216-222. Van Lieshout, J. J., Wieling, W., Karemaker, J. M., & Secher, N. H. (2003). Syncope, cerebral perfusion, and oxygenation. Journal of Applied Physiology, 94(3), 833-848. Wernstedt, P., Sjöstedt, C., Ekman, I., Du, H., Thuomas, K. Å., Areskog, N. H., & Nylander, E. (2002). Adaptation of cardiac morphology and function to endurance and strength training. Scandinavian journal of medicine & science in sports, 12(1), 17-25. Proprioception is a sense in just the same way as vision, hearing, touch, taste and smell. It relies on sensory organs called proprioceptors located within muscles, tendons and joints that enable the sensation of tension, force, pressure and movement (Sherrington, 1906). This sensory feedback enables us to detect the position of our limbs and entire body (Gollhofer, 2003; McMorris, 2014) and therefore is critically important to the athlete in learning sport skill. The ability to detect movement as a result of feedback from proprioceptors is also instrumental in enabling the calibration of force required to produce movement. Pacinian Corpuscles In the connective tissue that forms the joint capsule Respond to vibration stimuli (Halata & Baumann, 2008). Knowledge of proprioception enhances the coach’s ability to teach sport skills and to understand the differences among athletes in functional capability (Levine, 1997). Proprioception is the key sense involved in learning new movement patterns and knowledge of this persuades the Weightlifting coach that issuing verbal instructions is much less important than physical manipulation of the athlete to “feel” the correct body positions required at various stages of the lifts. Furthermore, in the process of learning any new movement patterns, there is always considerable ‘trial and error’ on the part of the learner and it is proprioceptive feedback that plays a vital role in this process. In just the same way that humans are not equal in sight, hearing, smell or touch, it may well be that differences in coordination and movement efficiency may be due to differences in proprioception. It is obvious to those involved in sport coaching that there is a significant difference among individuals in the ease with which new skills are learned. A reasonable hypothesis for this difference is that individuals who gain a frequent and wide variety of physical education and sport experience at a young age, develop an enhanced capacity of the brain to interpret proprioceptive feedback. This early adaptation of the brain and central nervous system allows the individual to more easily learn new physical skills at a later stage of life. This phenomenon is observable when individuals with years experience in gymnastics begin to learn Olympic Weightlifting movements. In Weightlifting, the predominant interest is in what makes muscle tissue contract and whether we can find methods of training to enhance the athlete’s ability to contract muscle tissue more strongly. However, we give less thought in general to the systems of the body (afferent systems) that detect and control movement, and provide an awareness of the force that muscles produce (Gollhofer, 2003). In our constant search for improved training methodology, the question needs to be asked as to whether the early learning phases of the Weightlifter should include a greater variety of movement patterns that develop proprioception. For example, the training of the beginner Weightlifter might include a wide variety of non-weightlifting explosive movements, balance and stability exercises, and spatial awareness activities as can be found in other sports. Such a varied diet of movement patterns may enhance the proprioceptive capacity of the athlete. Efferent system Relays information from the central nervous system to stimulate and cause changes in body tissue, for example muscle contraction. The importance of variety in the exercise schedule for Weightlifting was discussed in classical Russian literature on Weightlifting (Korneluk, 1977; Vorobiev, 1978). Bearing in mind that Womens Weightlifting did not exist in Vorobiev’s day, he stated “An essential part of young Weightlifters’ training is using every possible means that will nurture all-round physical development and fitness. All-round physical preparation allows a young weightlifter to successfully develop his physical abilities, improve his nervous system, his musculo-skeletal system, his cardiovascular system, his respiratory system, and other vitally important organs, and to enhance the motor skills needed in sports and work activities” (Vorobiev, 1989). Costill, D. L., Wilmore, J. H., & Kenney, W. L. (2008). Physiology of sport and exercise. Human Kinetics. Halata, Z., & Baumann, K. I. (2008). Anatomy of receptors. In Human Haptic Perception: Basics and Applications (pp. 85-92). Birkhäuser Basel. McMorris, T. (2014). Acquisition and performance of sports skills. John Wiley & Sons. Sherrington, C. S. (1906). Yale University Mrs. Hepsa Ely Silliman memorial lectures. The integrative action of the nervous system. Vorobyev, A. N. (1978). A textbook on weightlifting. International Weightlifting Federation. This article provides some theory about the concept of muscle coactivation and strength. The importance of this theory is that it helps to explain why Weightlifters must engage in training that is highly specific to the movement patterns of the Olympic Lifts rather than generalist strength training. Fixator Muscles that increase in contractile tension to stabilise segments of the body while the action of agonists and antagonists cause movement. When we think of the force required to lift a weight, there is a tendency to think mostly about muscle contraction within the agonist muscle group. For example, while performing a squat exercise we tend to focus on the contraction of the quadriceps muscle group to cause extension of the knee joint. 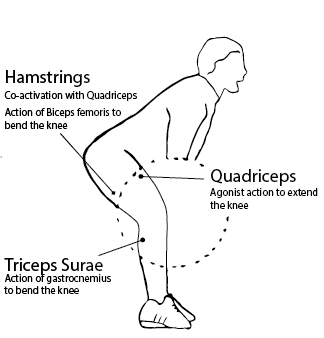 However, contraction also takes place within the opposing antagonist muscle group, in this case the hamstrings. This contraction of agonist and antagonist simultaneously is called co-activation and thus movement in the knee joint will be the net effect of force generated by the opposing muscle groups (Aagaard et al., 2000). This co-activation of the antagonist is considered to have an important function in stabilising and protecting the joint (Quinzi et al., 2015, p48). Thus, at every angle of joint articulation, the extent of forces developed within agonists and opposing antagonists controls the speed and extent of movement within a joint. In the context of Olympic Weightlifting, the performance of the classical lifts requires a high degree of precision of co-activation across multiple joints and this poses a significant motor learning problem. The development of precise co-activation is aspect of neural adaptation. An excellent example of this is found in the actions of muscles that cross the knee joint. During any extension of the knee joint as a result of contraction of the quadriceps, the Biceps Femoris (BF) is co-activated. The BF is bi-articular (crosses two joints) and has a hip extension action and a knee flexion action. These dual actions of the BF create an interesting phenomenon during the pull in Weightlifting. As the weightlifter raises the bar from the floor to the knee, the legs straighten at the knees as a result of the agonist action of the quadriceps. However, as the bar passes the knee, it is normal to see the knees re-bend. This knee re-bending is not as a consequence of purposeful learning of technique but as a result of tension developed in the BF which is acting not only as an antagonist to the quadriceps but also as agonist in hip extension. The problem for the Weightlifter is exacerbated by the action of the Gastrocnemius, another bi-articular muscle, which not only extends the ankle but flexes the knee. This re-bending of the knee is favourable to the athlete if it occurs after the bar passes the knees. However, for many athletes it is common to see the knees thrust too far forward as the bar approaches the knees. The angle of the knee thus created causes either the bar to hit the shins or else the athlete must develop a pull technique that moves the bar around the knees. The moment-by-moment precision of tension developed in agonists, antagonists and fixators is a wonderfully complex phenomenon controlled by our central nervous system. The achievement of this control provides efficiency of movement and is perhaps another way to understand what is meant by skill. However the degree of precision achieved in muscle coactivation and strength of contraction achieved across all joints depends on whether the exercise is familiar or unfamiliar (Busse et al., 2005). 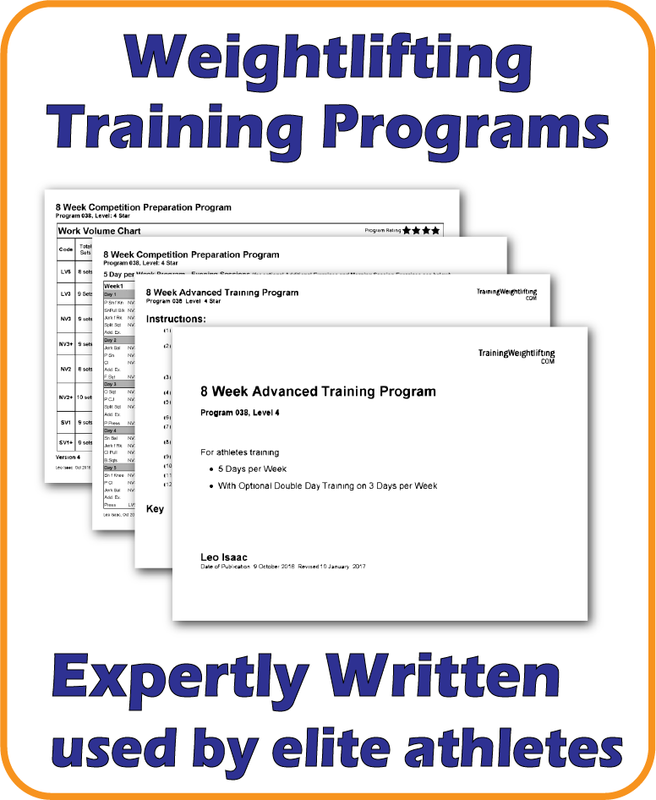 A common phenomenon observed by Weightlifting coaches occurs when someone with extensive training experience with weights (but not Weightlifting) attempts to learn the classical lifts. What is observed is a tremendous struggle to cope with quite basic movements because the exercise is unfamiliar and there is excessive coactivation that impairs movement (Busse et al., 2005). The learned coactivation that results from the regular performance of non-Weightlifting exercises becomes a major source of interference and annoyance. In such circumstances, there is not an efficiency of movement and the athlete appears to work excessively hard, even harder than someone with no previous weight-training experience. With persistence, however, the central nervous system modifies the previously learned patterns and thus co-activation appears to reduce in response to learning a new skill (Vereijken, Whiting and Newell cited in Busse et al., 2005). Aagaard, P., Simonsen, E. B., Andersen, J. L., Magnusson, S. P., Bojsen‐Møller, F., & Dyhre‐Poulsen, P. (2000). Antagonist muscle coactivation during isokinetic knee extension. Scandinavian journal of medicine & science in sports, 10(2), 58-67. Busse, M. E., Wiles, C. M., & Van Deursen, R. W. M. (2005). Muscle co-activation in neurological conditions. Physical therapy reviews, 10(4), 247-253. Quinzi, F., Camomilla, V., Felici, F., Di Mario, A., & Sbriccoli, P. (2015). Agonist and antagonist muscle activation in elite athletes: influence of age.European journal of applied physiology, 115(1), 47-56. As a consequence of normal physical activity, it is estimated that 1-2% of skeletal muscle tissue is synthesised and broken down on a daily basis (Rasmussen & Phillips, 2003). This biological process is normally in equilibrium and therefore skeletal muscle mass remains relatively constant unless there is a stimulus for change. Resistance exercise is a potent stimulus which causes not only an increase in protein synthesis but also an increase in protein breakdown (Borsheim, Tipton, Wolfe, & Wolfe, 2002). This elevation of both synthesis and breakdown is evidence that significant “remodelling” of muscle protein occurs as a result of resistance-training (Rasmussen & Phillips, 2003). If the resistance training stimulus is maintained over a sufficient period of time, the constant remodelling of muscle protein generally leads to a visible increase in muscle mass, a phenomenon called hypertrophy. This gain in muscular size is attributed to prolonged anabolism, a state in which the rate of muscle protein synthesis is greater than the rate of muscle protein breakdown (Chesley et al., 1992). In Weightlifting, there is particular interest in hypertrophy as we generally associate larger muscles with increased strength. Therefore we are also interested in the conditions that contribute to and maintain a state of anabolism. Among the most important of these conditions are the appropriateness of nutrition, the quantity and type of physical activity and the influence of the endocrine system (hormones). In regard to nutrition, muscle protein synthesis requires an availability of amino acids. Any meal containing sufficient protein as a source of amino acids that is consumed within 24 hours of resistance exercise results in a net muscle protein accumulation (Rennie & Tipton, 2000). This is because muscle protein synthesis occurs 1-2 hours into the recovery period postexercise (Booth, Nicholson and Watson, 1982) and remains elevated for up to 24h (Chesley et al, 1992; Biolo et al, 1995). The nature versus nurture argument is prevalent in sport. In Weightlifting, elite athletes are often considered to have a genetic predisposition for speed and strength. However there is no conclusive evidence of this. Coaches and athletes in Weightlifting are understandably interested in the anatomy and function of muscle tissue. Our greatest desire is that such knowledge will enable us to improve our training methodology and explain why it is that individuals differ so considerably in athletic ability. In our search for knowledge, it is inevitable that we will question, at some time or other, how the world’s best athletes in Weightlifting can develop such incredible strength and power. Is it that such athletes are simply freaks of nature possessing a composition of muscle tissue that is significantly different to the ordinary man in the street? Or is it that such athletic prowess is merely the product of an exceptional training environment? Many people believe that high performance in sport requires both factors, a genetic predisposition and an extent of training that exhausts every possibility to nurture the athlete’s talent. This nature versus nurture paradigm is a constant source of argument and debate and has stimulated a great deal of research. For the spectator watching the Olympic 100m final, genetic predisposition seems perfectly obvious. Not since 1980 has an athlete of Caucasian ethnicity won this event, and indeed the overwhelming majority of finalists have African ancestry. Nowadays we also witness a great deal of success in Weightlifting among Asian nations, particularly the Chinese, and for many people this adds weight to beliefs about the role played by genetic factors in sporting success. But in science, the topic is not at all settled. For example, the importance of genetic factors in determining muscle strength has been gauged by researchers to range anywhere from 0% to 97% (Huygens et al., 2004).